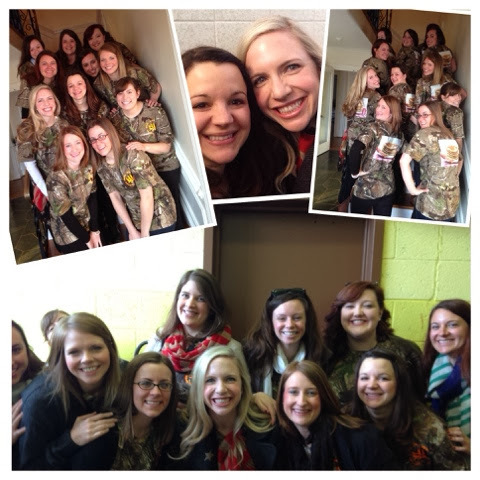 This past weekend, my girlfriends and I went on our annual girls weekend: Maple Fest! To give you an example of how great this trip is, three of our friends that have moved away since the trip began flew back in town for this epic weekend. In honor of this trip being in its 5th year, we decided it was only appropriate to have t shirts made. Of course they were camo, of course they had a stack of pancakes on them (the main point of the trip), of course some delicious dessert meat (otherwise known as bacon) was displayed, and of course a can of coke was depicted (because everyone knows the only way to keep eating more pancakes when you are full is to burp with the aid of an effervescent coke). The weekend got started right after work on Friday. We met up at Beth's house (our gracious host) and then got on the road. In years past we have stopped at the Cracker Barrel on the way, but this year we wanted to get to the gorgeous house early. Like always, when we arrived at the estate, Becky (Beth's sweet Momma) had a mountain of goodies ready for us. We could have easily hosted a bake sale with the amount of goods she prepared! The back of our shirts, my pizza dinner I picked up before we left, and the spread of goodies we arrived to! The next morning we woke up at the crack of dawn. After a round of baked goods for first breakfast and filling up our snack packs (bags filled with even more of Becky's goodies), we took some prom pics on the stairs and hit the rode for the pancake breakfast. 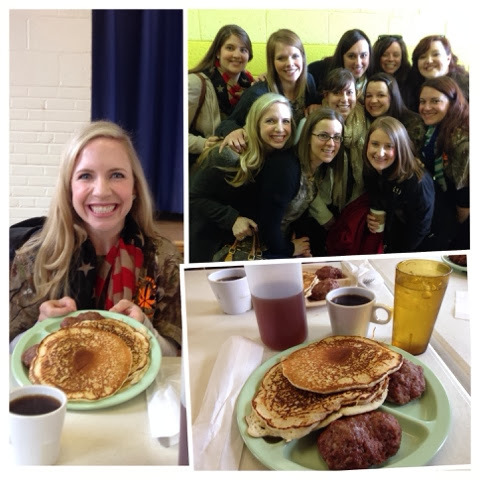 One year we waited in line for over 2 hours for pancakes so we know the importance of getting there early. After about an hour in line, we had our breakfast and we were ready to eat!!! The pancakes were just as delicious as ever and everyone at the breakfast loved our shirts. Success! Successful group shot! Everyone is in it! 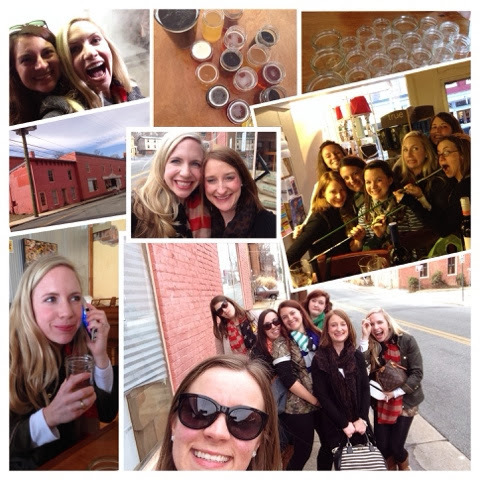 After a quick stop at the Sugar Farm (where they harvest the maple and make the syrup), we headed into Downtown Staunton for some wine tasting and bar hopping. At one point during the afternoon it was decided that we call our old friend Luke and tell him to come meet up with us, and HE DID!!! Sadly, I didn't get a picture of him. He still owns his water business and it sounded like life has been going well for him! 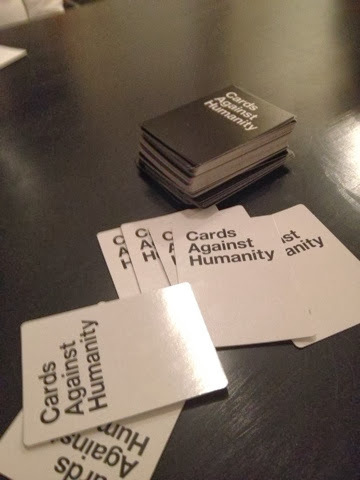 That night we ordered pizza and played Card Against Humanity. I have been hearing nothing but naughty good things about this game...and they were all true! I loved it! Can't wait to play again! The next morning, I awoke to the most delicious smell around...bacon! Mike and Becky were already over and cooking "family breakfast." Every year, we end the weekend with a big breakfast with Beth's parents. Everything is homemade including the biscuits and all of the preserves and jams. After we packed up and said good by to the beautiful house, Becky and Beth drove us over to see their family farm. It is so beautiful out there and it made me miss Texas. Although the landscape is very different from the Lone Star State, there is nothing like getting out in the country and away from all of the city craziness. After the tour and a stop at Beth's house to look at pictures of her as a little girl (amazing), we started our trek back to the city. This is always the point of the trip where you are feeling the weekend of indulgence: stomach aches from food and headaches from alcohol. However, this minor detail didn't stop us from making a quick detour to Cobbler Mountain Cellars. They are my favorite winery in the area, and Alycyn used to work there. We enjoyed a VIP tasting and a behind the scenes tour of CMC's new tasting room which opens this weekend! I am already looking forward to going back! 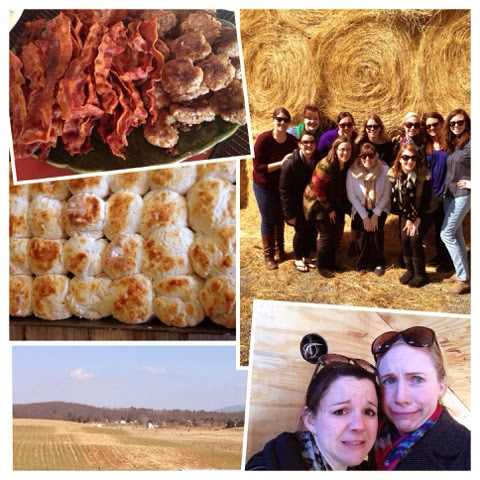 Bacon, Homemade Biscuits, Farm, Group Hay Pic, and Lanie and I on the Wine Tour. We are scared of heights. 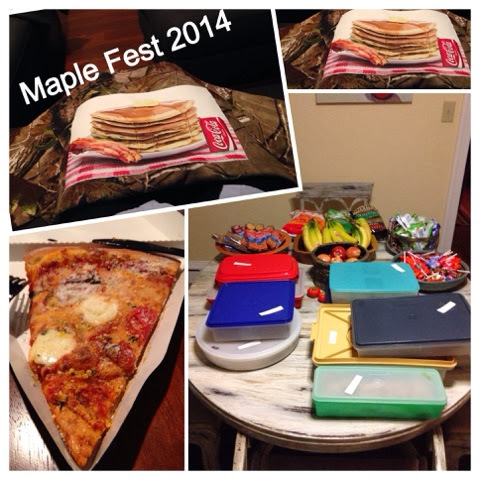 As always, Maple Fest was another success. I am so thankful for the friendships I have made in DC, and I look forward to many more years of maple, bacon, girls weekends and laughs! Hahaha of course! They were too funny to leave off! Oh wow that looks incredible!!! It really was and always is!!!! Your wedding is so close...EEEE! So happy for y'all!